Uniquely found in the Gospel of St Luke, is the context provided for St Peter’s confession. The exchange arises from Jesus’ prayer time. Several times in the Gospel we find Jesus praying in solitude: before being tempted in the desert, when He elected the Twelve, at Gethsemane. It is as if St Luke provides us with the bread crumbs to locate Jesus. Where can you find the Lord, except in prayer? Only the experience of silence and prayer offers the proper setting for the growth and development of a true, faithful and consistent knowledge of that mystery. After this experience of prayer Jesus asks a critical question: “Who do you say that I am?” Jesus’ question tries to teach them how their faith, to be true, must be separated from the views of the world. Pope Benedict XVI explains that, “there are two ways of “seeing” and “knowing” Jesus: one – that of the crowd – is more superficial; the other – that of the disciples – more penetrating and genuine. The disciples were invited to move beyond the perceptions of the crowds. But this was not enough. They were now challenged to move beyond their own personal confessions. In the Synoptic Gospels Peter’s confession is always followed by Jesus’ announcement of his imminent Passion. The passion predictions are not meant to be stand alone. To understand Jesus’ true identity, to understand the role, identity and mission of a disciple who is called to be a follower of Jesus, one needs to understand and assume the challenges that came with the Passion. Indeed, the titles attributed to him by Peter – you are “the Christ”, “the Christ of God”, “the Son of the living God” – can only be properly understood in light of the mystery of his death and Resurrection. And the opposite is also true: the event of the Cross reveals its full meaning only if this man who suffered and died on the Cross is truly “the Christ of God.” If the identity of “Christ” can never be separated from his passion, then the identity of a Christian can never be separated from the cross. Luke’s gospel adds a certain intensity to the demand of discipleship expected of those who wish to follow Christ. The disciple is not only expected to take up his cross once in his lifetime, but the cross is to be taken up ‘daily.’ The cross is thus lived in the every-day of on-going history. For a disciple of Christ to take up his cross is for him to be willing to start on a death march. To be a disciple of Jesus Christ is to be willing, in His service, to suffer the indignities, the pain, and even the death of a condemned criminal. 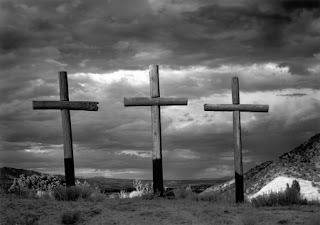 I’ve heard people describe our crosses as burdens we have to bear in our lives—the chronically ill relative, the alcoholic or unfaithful husband, the demanding boss, a short temper, recurring health problems. So taking up your cross means putting up with these things, enduring them and soldiering on. We basically have no choice in the matter. With self-pitying pride, they say, “That’s my cross I have to carry.” Such an interpretation is not what Jesus meant. The cross was never meant to be a mere accident, an unwanted burden. Grudging reluctance to bear the cross daily can only lead to resentment – to see life as a curse, rather than a blessing even in the midst of our daily crosses. What made the cross salvific was precisely the freedom and deliberateness by which Christ chose to embrace and die on it. It is only in recognising the necessity of the cross in our Christian lives,that we can choose to resist the temptation of fleeing from it. Our two Popes have given us a potent reminder of the pervasive necessity of the cross. In his last address to an emotional crowd, Pope Emeritus Benedict reminded the Church that his resignation did not mean coming down from the cross. He must have been prophetic as proof of this is found in his continuing crucifixion by critics of the Church and pseudo-fans of Pope Francis. The latter extol the simplicity of the new Pope at the cost of tarnishing the character of the old one. They equate the Pope Emeritus with their own poor notion of the Middle Ages—dark, backward and decadent—and speak as if the saintliness of the new Pontiff is an anomaly among the Successors of Saint Peter. Pope Emeritus Benedict continues to bear the cross, not just as a misunderstood figure, a victim of a relentlessly aggressive media, but he chooses to bear the cross for the whole Church. His decision to live a monastic life of prayer within the confines of the Vatican, hidden from the world, is his free and deliberate decision to bear his cross for the Church and the World. It is a sign of courage, not a sign of cowardice; it is an act proclaiming the victory of cross, rather than resigning oneself to defeat.